I’m a member of Cycling NSW’s Women’s Commission which I joined earlier this year. By way of background, the Women’s Commission (like a committee) works “across the sport of cycling in NSW to ensure the development of policies and initiatives which promote participation amongst women and girls of all ages into the sport and recreation of cycling”. I must admit that I wasn’t sure if volunteering for this role would be a complete waste of time and we’d just sit around ‘shooting the breeze’, but I’m pleased to report that the focus is on action and getting events happening. Here’s a brief summary of the main initiatives for 2016. The #Five100 Challenge is a series of women’s only 100 km rides to encourage women who are already keen recreational road cyclists to step up and challenge themselves by completing five 100 km rides. There are 15 women’s 100 km rides being organised by cycling clubs across Sydney, the Central Coast, Hunter Valley and Central Tablelands. I’m actually organising two of the rides under the banner of my cycling club – Lidcombe-Auburn Cycle Club (LACC) which are on Sunday, 3 April and Sunday, 5 June. You can register via the Cycling NSW website by following this link. Cycling NSW ran its first ‘Come ‘n’ Try’ racing series last year and decided to run it again in 2016 to encourage female road cyclists to try racing in a nurturing, educational environment. We hope to attract current Cycling Australia licence holders, both racing and recreational who haven’t tried racing much before, and other female cyclists over the age of 18 who ride a road bike, but are not members of a club. Here’s the events we have planned. You’ll be able to find out more on Cycling NSW’s website shortly. 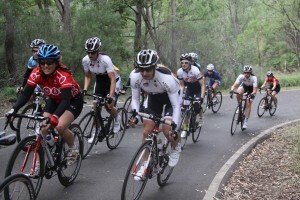 This series has been run by Cycling NSW for the past few years and is gaining in popularity. It gives female racers from elite to slower riders the chance to race against women of a similar level. They’ll be four grades – A, B, C and D for each event with a cumulative points tally.